Fish do not sweat. They live in water. Sweating would be silly. But if fish did sweat, and they wore sweatpants for a month without washing, I know what they’d smell like: a Synandrospadix vermitoxicus bloom. Synandrospadix is a monotypic genus, which means that there’s only one kind, and it’s the vermitoxicus species. They’re from warm, humid places like South America, which means its a strictly indoor plant here in San Francisco. Vermitoxicus means that it’s toxic to worms and possibly the rest of us, but that’s apparently a matter of debate among the botanically-minded. Either way, I’m not going to be eating it. 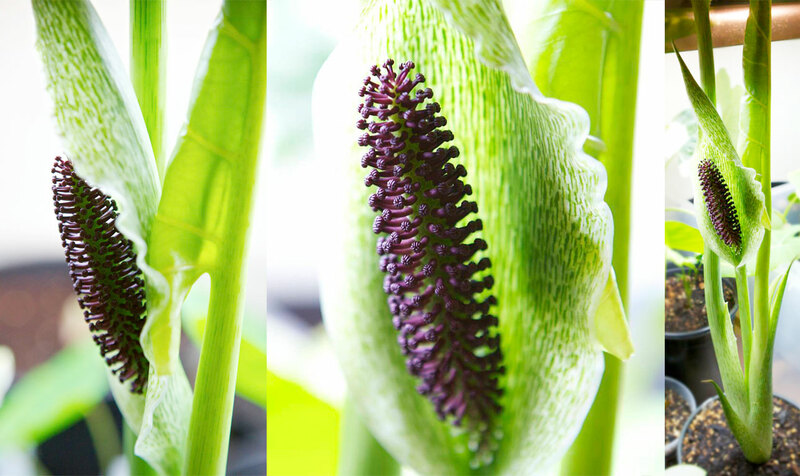 Like the rest of the Aroid family (Colocasia, Alocasia, Spathiphyllum), it has an inflorescence (aka “flower”) made of a spathe and spadix. Most Aroids have kind of plain blooms, but this one is just amazing. The spathe is a light green with dark green lines, and the spadix has dozens of spikes with little purple fists. Naturally, those are the boy parts. 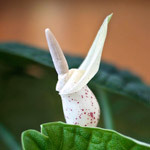 The girl parts are lower on the spadix and are green and white. While it’s not as stinky as other members of the tribe (I’m looking at you, Amorphophallus), it’s definitely not a pleasant smell. Some online sources have described it as “rotten cabbage,” but I like my fish sweat description better because every time I walk by the plant I think, “Did I leave some fish in here? Oh, right.” The smell is there to attract pollinators to move pollen from the boy parts to the girl parts, but you can only really smell it if you get right in there and give it a sniff, which, of course, I did. 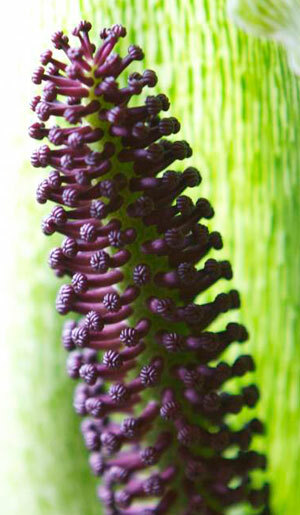 If you love weird plants, this one’s definitely on the list. And the best part is, it’s actually been very easy to grow. I got the plant last year. It went dormant around November and I let it dry out completely. I started watering it again in February and the first leaf began to emerge from the bulb after just a few days. I love the plant because it’s just so weird looking. The lines on the spathe are also on the leaf stems, making it just fascinating to behold. It grows fast and intense and then takes a good long nap. I can relate to that. It's easy to see how inviting the whole scene would be if you were a fly and into that sorta thing. 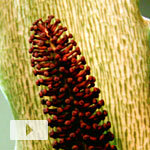 You knew I couldn't watch that Synandrospadix vermitoxicus bloom without doing a timelapse video of it, right? 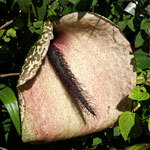 It has been used in Argentina to kill the maggots of parasitic botflies infesting animals and to heal wounds. The names mean “jungle cabbage” and “peel hand”, the latter suggesting it is one of those horribly caustic aroids. So the vermi- are gusanos in Spanish, which means both maggot and worm as well as grub and caterpillar. Not the usual parasitic worms one might think of when hearing “vermi”. The tubers were eaten in times of famine, though possibly highly processed.